The consortium of the LIFE ALGAECAN project includes partners from Spain, Greece and Slovenia. uercasa, a leading company in the production of processed vegetable products at European level, is participating in the LIFE ALGAECAN Project, which is funded by the European Union through LIFE, a financial instrument used by the Union to provide support to environmental projects. The project’s objective is to reduce the environmental impact and the economic cost of the production of vegetables and greens through the cultivation of microalgae for the treatment of waste. The partners intend to develop a demonstration plant to test a sustainable wastewater treatment model for the fruit and vegetable processing industry. This will be based on the use of heterotrophic microalgae. Heterotrophic microalgae are those that require organic compounds for their nutrition and that grow in the absence of light. They have great potential to eliminate organic carbon and various types of nitrogen and phosphorus compounds from wastewater, which use it as a source of carbon and energy without the need for sunlight. Subsequently, these microalgae will serve as raw material for the production of biofertilizers, animal feed, etc. To this end, the project consortium will design and develop a prototype plant, powered by renewable energies (specifically, by solar energy and biomass support), with the aim of minimizing the carbon footprint and operating costs. This plant will be set up in two test facilities during a period of six months. One of them in the facilities of the company Huercasa, in Segovia, Spain; and the second in the facilities of the VIPÎ company, in Slovenia. The technology developed in this project will, on the one hand, reduce the cost of fruit and vegetable processing and, on the other, tackle the environmental impact associated with the generation of waste in the form of sludge, as is the case with traditional aerobic treatment systems. Moreover, it will make it possible to obtain high quality effluents that can be reused for irrigation or cleaning, or discharged to riverbeds. The ultimate goal of the project is to replicate its results in other places. 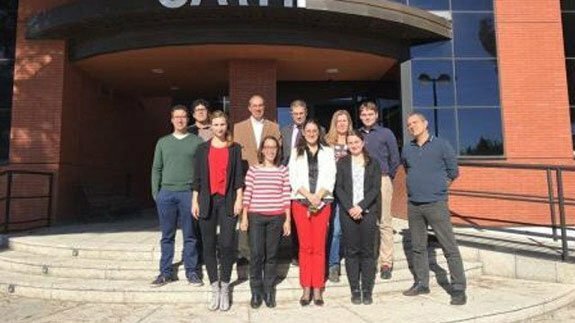 The consortium of the project is formed by the CARTIF Technology Centre (as coordinator), HUERCASA (Spain), the University of Athens (Greece), the AlgEn Technology Centre (Slovenia) and VIPÎ (Slovenia).